Many of you know that I make a lot of my own pastels in my studio. Below is a photo of my last batch featuring raw pigments I purchased in the old ochre mining town of Roussillon, France. I hiked through one of the town’s retired ochre quarries which was admittedly something of a religious experience for someone like me. Walking in pigment, surrounded by pigment… leaving footsteps in pigment. The village surrounding the quarry is completely bathed in its signature ochre. It’s absolutely stunning. In ochre stained shoes, I hand carried small jars of these pigments across Europe and back to the California coast where they illuminate my studio shelves and drawings… still radiating their original energy . These small glowing jars of powder form the foundation of my handmade pastels featured in so much of my work. With minimal fillers, they are as close a I can get to drawing with the source. 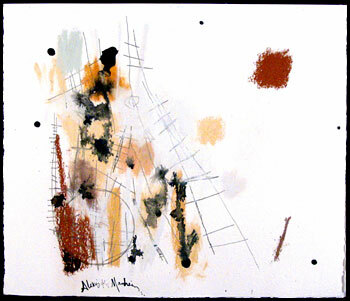 I hand form a variety of shapes that lend themselves to different types of mark making. The triangular ones are particularly useful when I want a line with a hard edge. The small oval ones have my own forefinger and thumbprint impressions moulded into them that make them particularly comfortable to use… especially for filling in large areas of color and long drawing sessions. I make batches that include many values of the same color by introducing increasing quantities of white to the base pigment. This can quickly create a substantial palette from just a few core colors. The ability to customize every detail is one of the great advantages of making my own pastels and choices made in their formation ultimately influence the ease and fluidity at which my hand moves over the page. I’ll return to pastel making in another post but for now, I’ll leave you with a glimpse of the beautiful French ochre mining town of Roussillon… I have a feeling I will have a studio here someday. You are currently browsing the archives for the Pastel Making category.